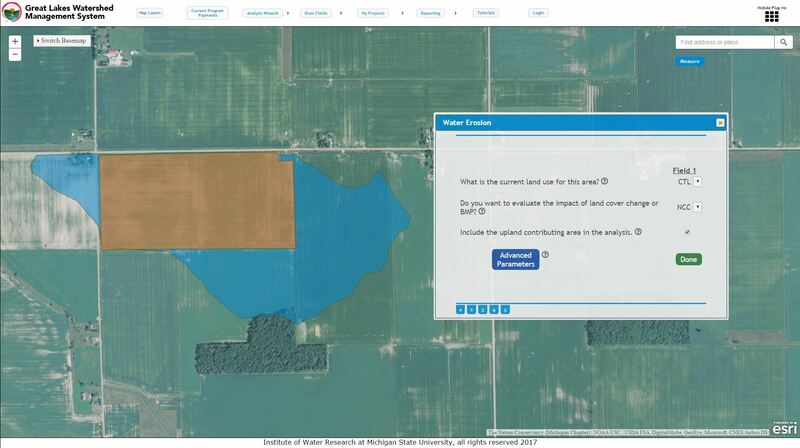 The Great Lakes Watershed Management System (GLWMS) is an online tool for evaluating, tracking, and reporting water quality and groundwater recharge improvements at the watershed and field scales. The system allows users to evaluate impacts on groundwater recharge levels and sediment and nutrient loading, based on changes in land cover or management. In addition, the tool allows users to save and track results, aggregate benefits across multiple projects and generate customized reports. GLWMS combines several models including High Impact Targeting (HIT) and the Long-term Hydrologic Impact Assessment (L-THIA) to evaluate non-point source pollution, and the Soil Water Assessment Tool (SWAT) to evalute groundwater recharge. The GLWMS represents the integration of several water quality modeling projects across the region, led by The Nature Conservancy, the U.S. Army Corps of Engineers Chicago District, IWR, and the Department of Agricultural and Biological Engineering at Purdue.